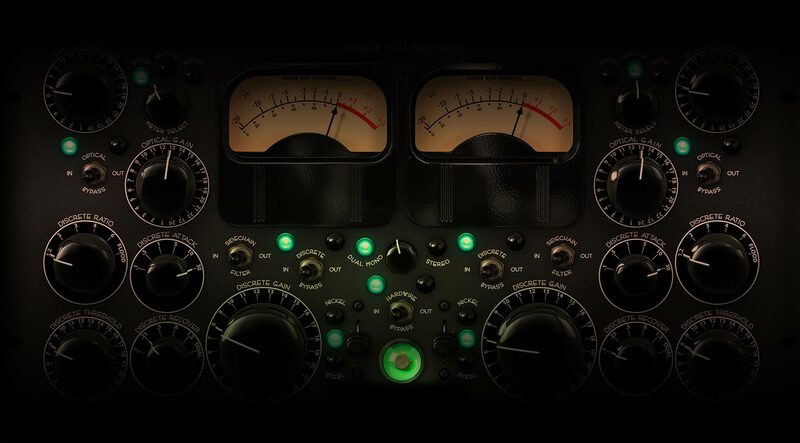 The world’s most remarkable and revered audio compressor — available as a UAD plug-in. The genius of the Shadow Hills Mastering Compressor plug-in is its ability to control dynamics in two stages — an Optical and Discrete (VCA). Both sections can be bypassed, effectively providing three compression sounds (Optical, Discrete, and combined) in a single unit. The Optical section is highly program dependent, with basic Threshold and Gain settings, and a two-stage release time akin to the classic LA-2A — perfect for gently taming dynamic range. The Discrete section takes over where the Optical section leaves off, provides precise control over gain, threshold, ratio, attack, and release. The Shadow Hills Mastering Compressor plug-in’s tonal palette is enhanced by a unique matrix which allows selection between three output transformers — Nickel, Iron, and Steel. By switching the selected transformer type in and out of the signal path, you can hear the different frequency response, distortion characteristics, and transient limiting of each transformer — going from “clean” (Nickel), to “colored” (Iron), to “dirty” (Steel). I bought my UAD apollo just for this plugin..It's AMAZING!!!! With it´s special compression caracteristics and extraordinary musical behavior the Shadow Hills Compressor is just a gorgeous dynamics tool. Simply perfect wether subtle comp or really musical pumping is required on single, prominent instruments and specially for beefing up whole master mixes (e.g. dance music). I'm late to the party with this one, but I'm in agreement with C. Allrich --- a light touch will get one far when employing the plug appropriately. It's been one of the secret weapons I'm using to master an ECM-ish guitar trio album. The clients are very happy and so am I. I can't help but thinking that those that are "confused" by the controls haven't taken five minutes to RTFM and understand the signal flow, etc. Agreed it doesn't completely nail the hardware, but it can still work wonders and provide the right sense of depth and dimensionality and glue that will sweeten many a mix or master. This is not a tool for squashing and smashing stuff. Although I'm sure it can do that (I've never tried yet) what it really shines at is mix bus processing with 1-2dB of gain reduction on each side. The transformer switching is nice but it is subtle (like the real thing) and you're going to need great monitoring to truly appreciate it. The fact that the DSP load is so low makes it an ideal choice when DSP is being consumed by other effects or users with less than a Quad/Octo. A shade on the real thing… but still killer. A friend has the real deal, and I use a Shadow Hills QUAD GAMA on every recording I do, so I am familiar with the manufacturer's products. The plugin lacks much of the character that makes the hardware unit so killer, but is so friendly on DSP resources that I find myself using it a ton regardless… just not in the same way I would use the hardware unit. The SHMC didn't blow me away for its intended 2-buss / mastering use. IMHO, this is the least impressive model of the real thing in the UA catalog. HOWEVER, I did buy it, and after using it a while now on other things, this plug is pretty good in its own right, and I'm finding it more useful to shape and color individual busses and tracks than to use across a whole mix or for mastering. Its a unique compressor, and the Trans options are great for giving different subtle textures to individual tracks. - 1 star for not being the best emulation. - 1 star for no dig only features like control link or ability to switch the signal path order of the compressors. (I often like fast before slow) And where's Brainworx's signature MS feature?? This compressor can control the audio image in an exciting way. Especially if you pay attention to to the how the threshold and gain controls are opening or closing up the image. Usually use this before or after the SSL or 33609 Compressor. Does nice things for my drums in a mix when I dial in the attack and release. Maybe a steep learning curve maybe not but worth it IMHO. I'm a big fan of Brainworx plug ins and this one is absolutely amazing. It can glue, enhance and compress the material and it looks as it sounds. To be honest, I was a bit sceptical about this emulation at first because it was not made by Universal Audio and does not use a lot of DSP power. Nothing but prejudices because as it turned out Brainworx made a fantastic sounding plugin with apparantly very efficient programming. So far I have used it as mastering unit and it does an excellent job on my program material (dense electronic music including acoustic sounds). The way it grabs the music is very nice and unique. The unit enhances the material without changing it original tone but if you want to you can even add some color with the transformers. Highly recommended plugin. I have used a lot of mastering units. I currently use Avalon 747 for my 2buss. With the Tube warmth, the incredible EQ and the very smooth compression this is my main go go. I tried it for 14 days on a lot of things like for mastering, on busses (drums, mix) and on solo tracks: lead vocals, bass, background vocal groups, acoustic guitars, snare.... etc. All I can say is WOW!!!!! It shines so many different sources and is very versatile. It definitely has some mojo in it - you can it very smooth or hard and aggressive and its very easy to set up - a few seconds and I have the sound that I want !! Don't try this plugin cause you'll buy it. I would put it on my bread if I could. A real beautyfier for just about anything. I have access to a major studio and they have one of these Shadow Hills comp. One of the studios engineers and I used the real comp on a song that I'm currently tracking there. We used it mostly on synths and violin's. Since this comp is musical it added some sweet sonic character to my tracks! I own the UAD quad card so i demoed this UAD comp at my personal studio and was amazed at how much alike they really are! So i had to buy it! Spot on UAD! Thinking of purchasing this? Stop wasting time and do it. Truly the most beneficial plug-in I've bought in a while. Don't believe it? Run the demo. I guarantee you will miss it when the demo lapses. I am a studio owner and producer at www.scottfrankfurtstudio.com as well as the director of design at Spectrasonics. I work with precision and "character" audio all day long... this is truly a must have tool. Wonderful sounding and accurate to the hardware! I've owned a hardware Shadow Hills Mastering Compressor for two years now and it has become an essential and amazing sounding tool for us ... I''ve AB'ed the plugin against it extensively now and it really holds up. The Optical section seems to be calibrated differently (a few clicks less on the threshold is needed to match the compression amount of the hardware unit), but once you compensate for that, it sounds dead on. $300 for multiple instances and no noise (and instant recall, and freezing) is a steal! I'm not sure why there's so much hate for this plugin in the reviews, equating it to Izotope? good god, ugh. Look. There are certain tools for certain jobs, and writing off this compressor because it failed at whatever you attempted it on only shows lack of understanding of your appointed skills as an engineer/mixer. Do I use this on instrument busses? vocals or guitars? Nope. Slap this on your two-bus, and forget the presets. Set the thresholds on both compressors as needed to just "tuck" the transients back, flip the side-chain on, and flip between Nickel, Iron, and Steel to find the right "glue" for your mix. Now tell me your mix doesn't feel that bit of extra life brought to it. This is not a plug in for heavy hands, period. I've used the hardware version on only a few projects (only purchased one a month ago) and used it mainly for mastering. The plug in is so close to the original, switching between both in the studio, in most cases it hard to tell the difference. I'm using it on the 14 day trial and no doubt Universal Audio will have an introductory price soon so someone like myself who travels a lot will have access to it on my apple laptop. I couldn't wait to try it on a track i mastered a couple of weeks ago where i had the hardware Manley Massive Passive into the Shadow Hill Compressor into a Ampex ATR102 out into the brickwall of a system 6000. Well I've done the same with the UAD-2 plugins and OMG... AMAZING. BUY IT! !